The Democrats’ sit-in on the floor of the House of Representatives is over–for now, and the House is out of session until after the July 4 holiday. There was, unsurprisingly, no vote on any gun control measure. And no one thinks that any remotely meaningful gun control measure would pass on the floor anyway. Speaker Paul Ryan, interviewed after trying to conduct business over chants from his colleagues, explained that the sit-in was a publicity stunt. He was absolutely right. Civil disobedience, including sitting in, is usually thought of as the tool of people who don’t have other ways to make their points politically. If we all made lists of those without political power, elected members of the House of Representatives wouldn’t come up high on anyone’s. But the chaos on the floor of the House as Speaker Paul Ryan orchestrated a recess over chants underscored both the Democrat’s marginalization in the House and the difficulties Speaker Ryan has with his own caucus. Mass media responded to the sit-in by talking about guns. CNN’s morning show featured interviews with the parents of victims of mass shootings–which is not routine programming. When protesters get a broader public engaged with their issues, they’re winning. Mass media responded by talking about Congress and the National Rifle Association. Vox published a listing of NRA contributions and rankings for every member of the House. Look up your rep! The Democratic caucus in Congress has demonstrated some vigor and commitment. Admittedly, it didn’t take the same courage that sitting in required in 1960. 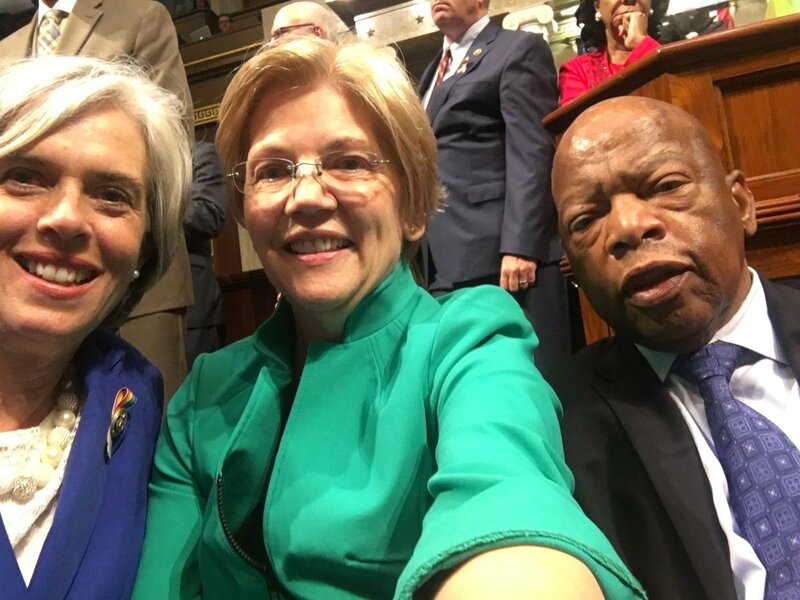 A half-century ago John Lewis faced hostile police brandishing clubs, dogs, and firehoses–and counterprotesters determined to do him harm; this time, Senator Elizabeth Warren brought donuts. By pulling off the sit-in, the Democrats hoped to have enlivened and engaged their base. 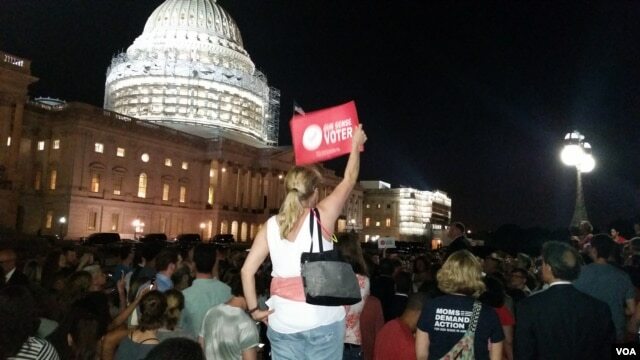 On rather short notice, activists turned up outside the Capitol in the middle of the night to support the sit-in. Democrats will be organizing and fundraising off the event for the next five months (See Chris Cillizza, a the Washington Post, on this). Putting an exclamation mark next to gun control should push the issue into the Presidential campaign as well. Strong positions from the candidates can mobilize their bases, who are mostly as committed on the wisdom of various gun control measures as they are to their respective parties. But the rather modest proposals now circulating are likely to appeal to swing voters–if the candidates can find any. This entry was posted in Uncategorized and tagged campaigns, Democratic Party, donuts, Elizabeth Warren, fire hose, gun control, guns, House of Representatives, John Lewis, mass shootings, media, National Rifle Association, Paul Ryan, sit-in, Speaker of the House. Bookmark the permalink.